Revised statutory documents introduced from 1 January 2017. 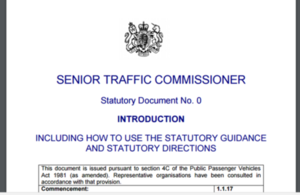 The Senior Traffic Commissioner’s statutory documents have been updated and republished. Most of the amendments relate to updated legal references (following Upper Tribunal appeal cases), which have allowed some minor grammatical corrections. Operators and licence applicants are advised to pay particular attention to the following changes. The document has been revised to clarify the findings traffic commissioners can make with regard to professional competence (paragraph 29). It also offers further detail around the requirements for requesting a period of grace (paragraph 61). The document has been revised to clarify the evidence that hauliers need to produce for cabotage operations to conform to the 2009 regulation (paragraph 39). It also offers guidance on steps that should be taken to prevent the future illegal use of a vehicle (paragraph 59). The document has been revised to reflect the Welsh Language Act 1993 and Welsh Language (Measure) 2011 requirements in the administration of justice. It confirms what the Office of the Traffic Commissioner is required to do when dealing with operators who use the Welsh language and how much notice operators are expected to give that the Welsh language will be used in proceedings (paragraphs 81-83). All 15 statutory documents can be accessed on GOV.UK.